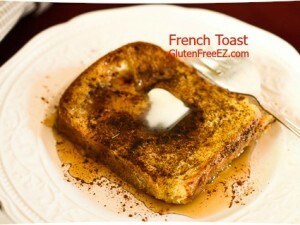 My aunt Ann always serves the most amazing New Year’s brunch, with this baked French toast as a featured favorite. Use it to warm up on one of our cold winter mornings, modified from original to be gluten-free. Recipe from "The Gluten-Free Hassle-Free Cookbook" By Marlisa Brown Scheduled for release March 2015. Melt butter. Add brown sugar and corn syrup and combine well. Spray 9 x 13 inch pan with cooking spray. Pour butter mixture into baking dish, arrange bread slices flat in butter mixture. Squeeze to fit in. In blender, mix eggs, milk, vanilla. Pour over bread slices covering completely. Sprinkle cinnamon on top of bread slices. Uncover and bake 350 for 30 minutes. Dust with powdered sugar. **Allergy Information: GF, SF, NF, PF, FF, SFF, V. Keep soy free by using soy free cooking spray. Make milk free by using a milk free substitute and margarine in place of the butter. Make egg free by using an eggless egg substitute. Make vegan by using a milk free substitute, margarine instead of butter, and an vegan egg substitute.